We really love our house in Norfolk. It was built in 1942 and has so much character. We've never lived in an older home before, but this has been one of our favorite houses. 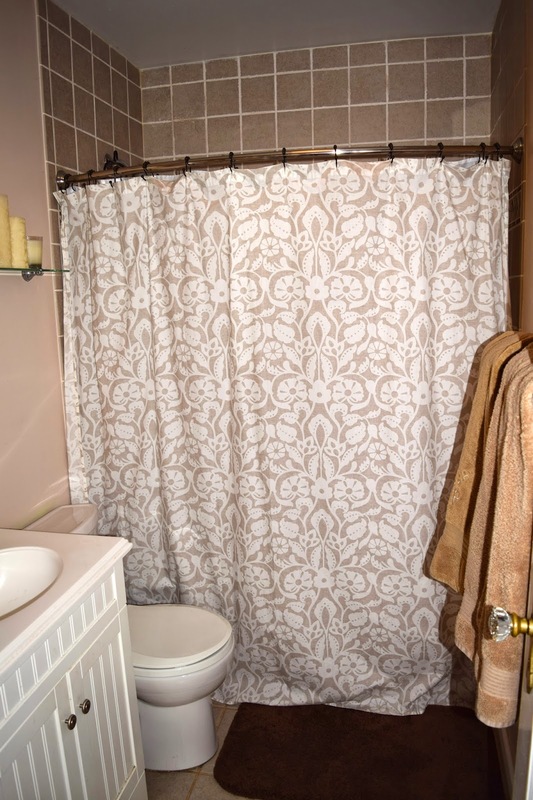 Even though it is filled with character and so many different people and stories have taken place here, there is one thing you cannot escape with an older home: small bathrooms. And by small bathrooms, I mean very small bathrooms. Bottom line: there is just not enough space. Before I go further, here's a look at what I'm working with. Not too bad, but there isn't much storage space. I've realized that there really isn't anything I can do to increase the square footage of the bathroom itself. Once a small bathroom, always a small bathroom. I suppose we could gut it and start over, but I don't think our landlord would be too thrilled if we decided to get our DIY on. Knowing the only real thing I could do to improve my problem was to employ some mad organizational skills, I quickly got to work with sorting, labeling, and downsizing where applicable. We have two small bathrooms in our home, so I used the storage space of the guest bath to house all of the products we don't use everyday or may have excess of (extra soaps, shampoos, nail polish remover, insect repellent, aloe vera, etc). For the main bath, I stored all of our everyday use items (my make-up, hair accessories, mouthwash, his razor, lotion, etc). I purchased small tubs that would fit underneath my sink and printed off labels to tape onto them so I would know what products were stored where. I also purchased a metal stand that would fit in the corner of my storage space that could house miscellaneous items. Obviously the back of the sink and pipe don't look great, but there wasn't much I could do for that. Just those minor organizational changes really made a difference! By categorizing and being strategic on what I stored where, I really maximized on space. 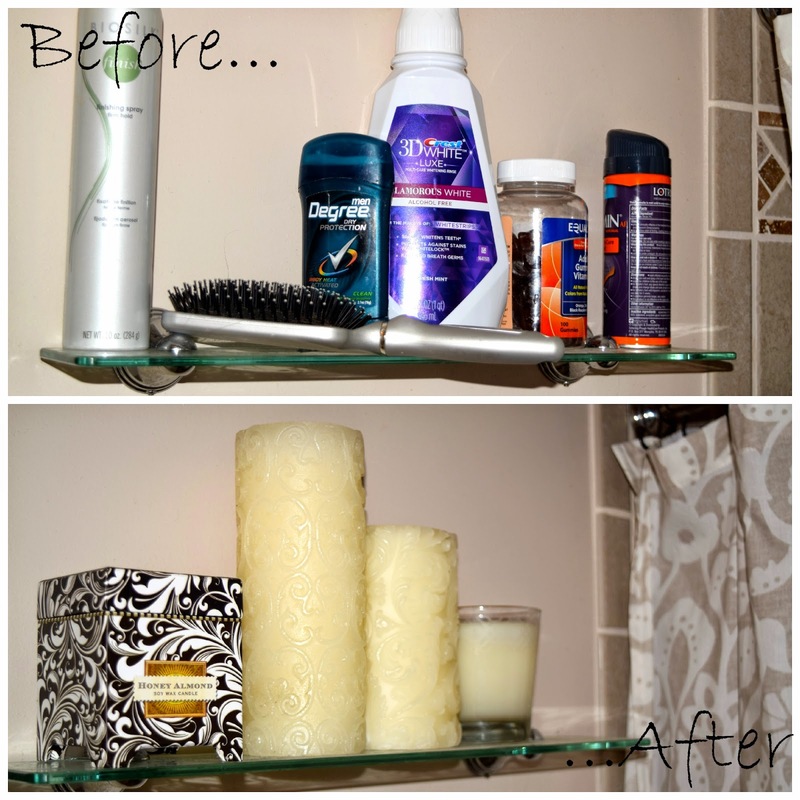 Now, my small shelf doesn't have to house toiletries. Instead, I have a spot for my beautiful candles! I wanted to add something decorative that wouldn't make the bathroom look even smaller than it already is, and this monogram was just the ticket. The clear tubs and metal stand can be purchased on the cheap, so this little organizational overhaul will not break the bank. 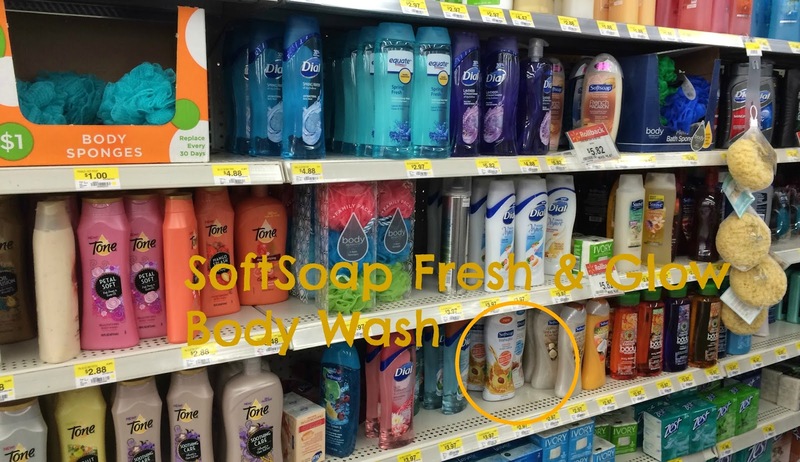 In the spirit of bathrooms, I also picked up a couple of new shower products at Walmart to give my dry skin an overhaul as we migrate into Spring. Also, I was kind of rewarding myself for the stellar organizing. I mean hard work deserves a little appreciation, right? 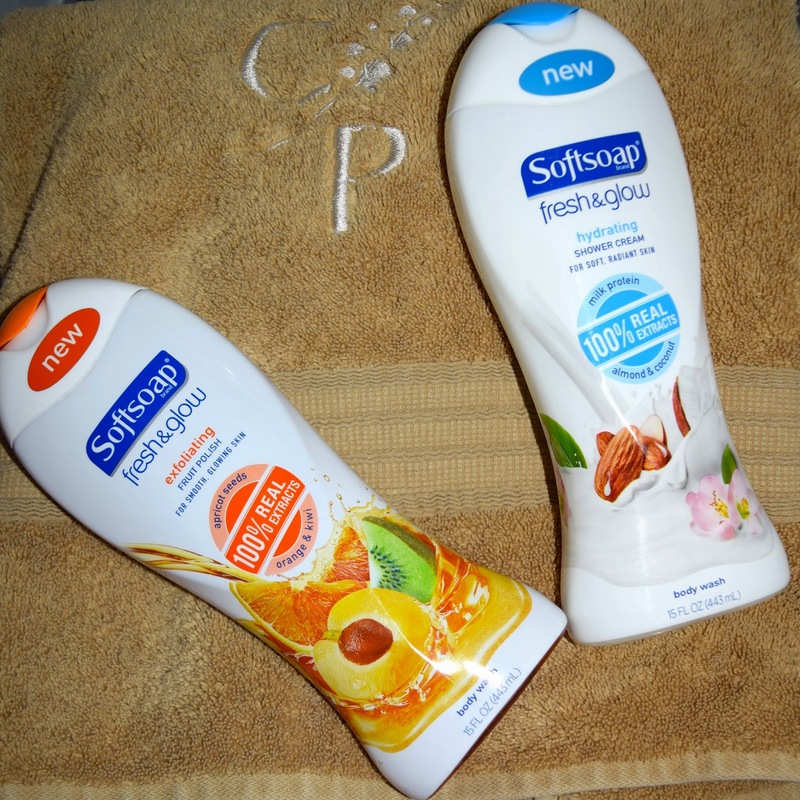 I chose SoftSoap Fresh & Glow Hydrating Shower Cream and SoftSoap Fresh & Glow Exfoliating Fruit Polish. Showers are supposed to be relaxing, but it was hard to relax before when I knew how junky the bathroom was. Taking a shower in my new and improved space with Fresh & Glow body washes that rescued my skin from this winter spell was nothing short of luxurious. I have battled dry skin like never before this winter. It gets dry in Texas, but Virginia definitely takes the cake. The Hydrating Shower Cream provided that long-lasting moisture I've so desperately needed, and the exfoliating apricot seeds in the Fruit Polish felt wonderful. Since these are new products, here is the aisle where I found them. I may have very small bathrooms, but a little organization and some new bath products really make it feel like a new space. Thank goodness, because there is nothing more relaxing than a warm shower. Am I right or am I right? I think what you did looks great! Our first house in NC had incredibly small bathrooms and I had to get creative with storage too. Our first apartment had the tiniest bathroom. You could barely shut the door while standing in it. It is one of my criteria now in house searches: the possibility of storage space in the bathroom. Very important! I ad a tiny bathroom in Colorado (house from the 1920s), and while it was SUPER cute, there was nowhere to store things... luckily, there was a space next to the teeny tiny sink that could fit those plastic stacking drawers... looked awful in there, but I had to do something to store my stuff!